As a kid Ed, made the horrible mistake of stumbling across his father's loaded gun and accidentally kills his mother. Fast forward to Ed in his college years and his father Big Ed, who has been cold and distant to his son since that horrible tragedy, calls him out of the blue. He needs Ed, his girlfriend Pam, and their friends to head to the old beach house to settle some affairs. It is on an empty island in the middle of nowhere and gives these kids a chance to have a wild fall break. It turns out this was simply a trap set by Big Ed who has decided to avenge his wife's death. Throughout the night, he stalks the kids and methodically and violently murders all of them until he finally confronts his son. lone police officer on the island. Sometimes the brutality of the kills are undermined by the cast's lack of talent, but strangely this just adds to the entertainment of the film. When one of the character is being gutted by the chainsaw rather than eliciting terror it gets laughs because of the actor's reaction to being sawed. In fact with as much fun as the Mutilator is, the laughs are definitely of enjoyment. 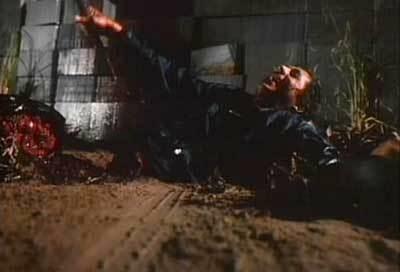 I can't remember the last horror film I saw with a climax as absolutely bananas as this one, where the killer who has been severed in half, still musters the energy to cackle hysterically and use an axe to chop a cop's leg off. if the filmmakers decide they need to travel to the beach house jamming out to a pop song which completely clashes with the tone of the rest of the movie.